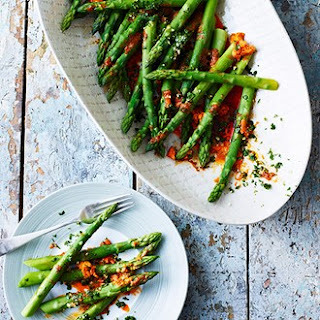 Nice as a starter or as a side dish for six people, seasonal asparagus with a little kick from the harissa. Young, thin asparagus should be ready as it is but older or thicker spears need the woody bits snapping off. Mash together the soft butter, harissa, lime juice and salt to make the harissa butter. You can steam the asparagus or cook it with the spears upright and the stems in a little boiling water. Either way don’t let them get too soft, they will take between 3 and 7 minutes depending on their thickness. You can test a spear with the end of a sharp knife. Meanwhile, make the gremolata by finely chopping together the garlic, coriander and lime zest on a cutting board. Remove the asparagus spears from the pan straight into a clean tea towel, to soak up excess water. To serve, put the asparagus onto a warm platter with knobs of the harissa butter. Allow it to melt a little, then scatter over the gremolata. Nice with a glass of Chardonnay. Recipe based on one from House & Garden.